At Colorado State University, Drs. 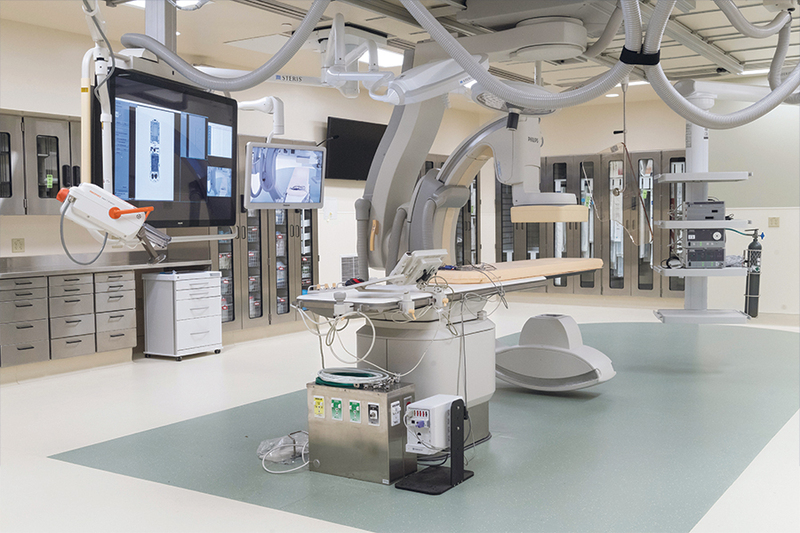 Brian Scansen and Chris Orton from the veterinary cardiology and cardiac surgery team are taking full advantage of a brand new, cutting-edge operating suite. The suite, housed at the James L. Voss Veterinary Teaching Hospital, spans 1400 square feet and features high-tech imaging displayed on high-definition monitors. The technology available in the suite allows Scansen and his team to more effectively view the inside of a patient’s body and guide devices to individual structures (like the valves around the heart and arteries) with ease. The cardiology team’s first opportunity for triumph in the new space came via a balloon valvuloplasty performed on a patient named Misty, a Great Pyrenees-Australian Cattle Dog mix. The surgery involved opening a faulty valve to increase blood flow to Misty’s heart. CSU clinicians said they were aiming for a 50% improvement of blood flow through the faulty valve, using minimally invasive surgery. In the end, they saw a 70% improvement. To learn more about the facility, visit cvmbs.source.colostate.edu. At the 2018 American College of Veterinary Internal Medicine (ACVIM) Forum, ELIAS Animal Health shared promising preliminary canine osteosarcoma results for its cancer immunotherapy. ELIAS is a clinical stage development company advancing novel treatments for cancer in companion animals. The company’s new study indicated that its new ELIAS autologous cancer vaccine, which features “a patented combination of vaccine and T cell infusion approach,” yielded exemplary survival times accompanied by minimal side effects. According to a company press release, the new immunotherapeutic is currently being distributed as an experimental product to veterinarians treating dogs diagnosed with cancer. For more information, visit eliasanimalhealth.com. PetSmart, one of the nation’s top pet product retailers, is continuing its efforts to expand its in-store veterinary care offerings by opening its doors to Independent Veterinary Operators (IVOs) to fill unreached locations. In a company press release, the company describes the ideal candidate as an independent veterinarian or group who currently owns/operates fewer than 50 locations and wants to grow their business by operating a full-service clinic inside PetSmart. Interested veterinarians can email ivo@petsmart.com to gather more information and learn about the next steps.